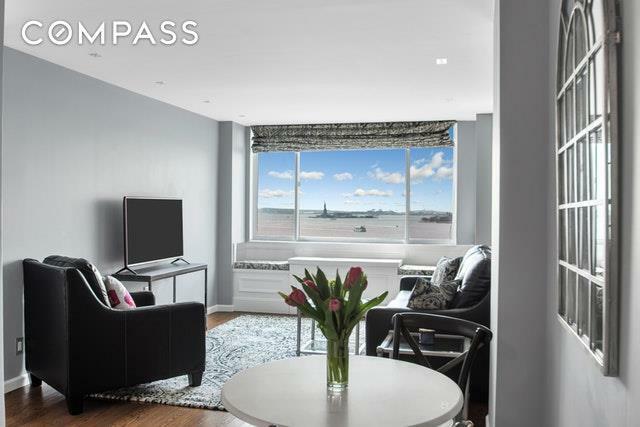 Wake up each day and top off every evening overlooking unobstructed views of the Statue of Liberty and Majestic Hudson River, enjoyed from your beautiful sun-drenched living space and private south-facing balcony where you can relax with a coffee or cocktail. The stunning vistas offers by this impeccably-appointed one-bedroom Battery Park City apartment, in the elegant full-service Liberty House condominium, enhance the luxurious lifestyle youll experience in a highly-desired locale.A perfect backdrop for entertaining or lounging, the large open living/dining room showcases views of the Hudson River from every vantage point. 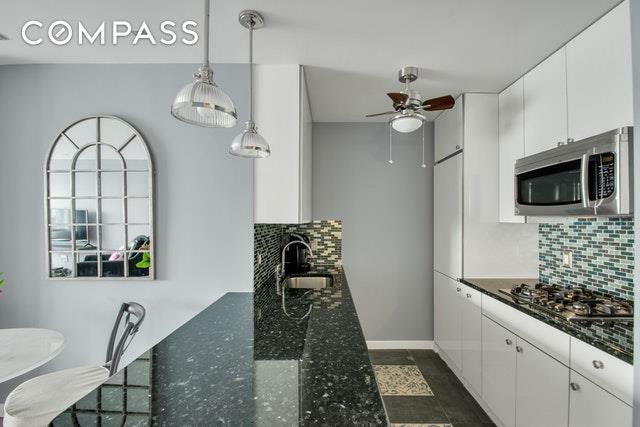 The recently renovated kitchen features modern stainless steel appliances, the open and airy space will inspire your inner chef, whether cooking up gourmet recipes or simply brewing up a cup of java. Unwind in the very comfortable king-size bedroom that can easily accommodate additional furniture like dressers and a desk, and features generous closet space for storage. Also recently renovated is the lovely full bathroom where you can refresh in style. A washer and dryer can be added to the home with board approval.The Liberty House is a 25-story luxury condo tower on the Hudson River waterfront, with a soon-to-be-completed exquisite brand new lobby, 24-hour doorman and concierge service, a live-in- super, common laundry room, bike room and storage. Residents also have access to a riverfront health club and swimming pool with an outdoor deck and retractable sunroof in its sister building across the street, at the Terrace Club. 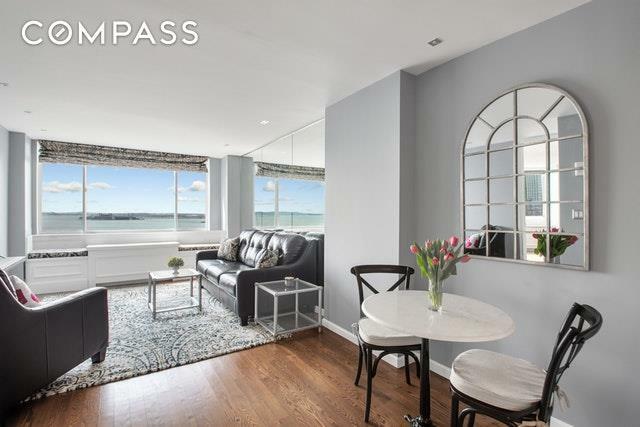 The location in picturesque South Battery Park is ideal, adjacent to numerous parks, and the breathtaking Hudson River Promenade where you can stroll, jog or ride your bike for more than 10 miles along Manhattan's west side. 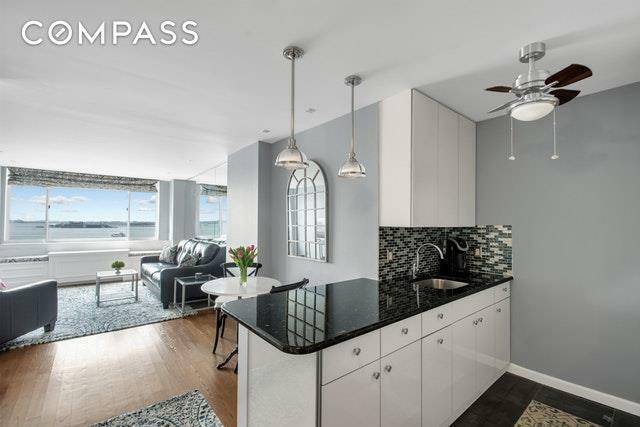 Alluring attractions also include fabulous Brookfield Place, a world- class retail, culinary and cultural center with chic shops, the European-style Le District marketplace, an enormous French market, waterfront dining and fine chef-driven restaurants. Another local highlight is Westfield, presenting the delectable fare of Eataly as well as a wide assortment of shopping venues. Pets are welcomed at The Liberty House with prior management approval.Please email me today to schedule a viewing of this exceptional home!